Lemon oil is acquired from citrus plant scientifically known as Citrus Limon belongs to Rutaceae family. 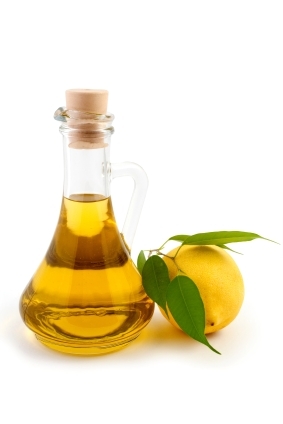 Lemon oil is also known as cedero oil (which refers to terpeneless). Lemon is an evergreen small tree that originated in India (Assam) and Pakistan and is widely grown in tropical, semi-tropical and warm temperate countries. Lemon tree reaches up to 20 feet in height and has stout spines, leaves are dark green, leathery and evergreen oblong, elliptical or oval and up to 14 cm long, Flowers buds are purplish and fruits are globose to oblong, ripen to yellow. Lemon oil is extracted from fruit peel of Citrus limon plant through cold pressed method. Properties: Lemon oil is clean, sugary citrus and slightly sour and has fresh, zesty aroma that uplifts and energizes the body and mind. Lemon oil is pale yellow to deep yellow, greenish yellow. It has characteristic odour and taste of the outer part of fresh lemon peel. Composition: Lemon is composed of α pinene, camphene, β-pinene, sabinene, myrcene, α-terpinene, linalool, β-bisabolene, limonene, trans-α-bergamotene, nerol and neral. Blending: Lemon oil is nicely blends with lavender, rose, sandalwood, benzoin, eucalyptus, geranium, fennel, juniper, neroli and elemi. It is used as cleansing of skin and brightening skin. It encourages hair cuticle to lie flat and makes hair shinier. It is used to refresh body and body as well as in perfumery. It is also used as stain remover as it removes stains from fabrics. It is used as natural air freshener. It supports lymphatic system and aids blood flow, reducing blood pressure. It is effective against fever as it bring down fever and provides relief throat infections, bronchitis, asthma and flu. It encourages immune system, improves functions digestive system and cleanses body. It is used for treatment of dyspepsia, cellulite and constipation. It helps in treatment for rheumatism and arthritis. It is effective against skin issues, for cleaning acne, cleaning greasy skin and removes dead skin cells, eases painful cold sores, mouth ulcers, herpes and insect bites. It is used for aromatherapy as it relieves irritation and improves concentration, uplifts spirit and clears mind. It is used in beverages; artificial drink concentrates to give taste of lemon juice. It is photo toxic oil so it should be not used before being exposed to skin. It can cause skin irritation and sensitizing in some persons. Consult to doctor before using lemon oil during pregnancy. Avoid using lemon oil near to heat, fire and flame. Appearance : Clear mobile pale yellow greenish yellow liquid. It may become cloudy at low temperature. Fatty oil & resinified oil : It complies with the test. Storage : Store in cool and dark place at temperature not exceeding 25°C.